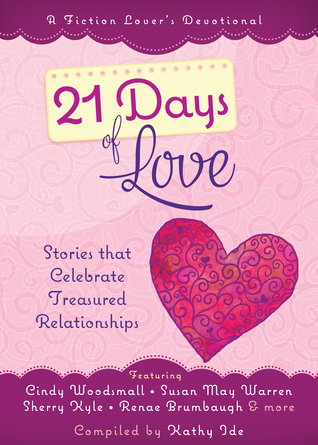 Today I am reviewing 21 Days of Love compiled by Kathy Ide, featuring Cindy Woodsmall, Susan May Warren, Sherry Kyle, Renae Brumbaugh, and Lori Freeland, & more. Love can be found in many treasured relationships: boyfriend-girlfriend, husband-wife, parent-child… with a special friend, teacher, or pet… in the kindness of a stranger. We even have a national holiday to celebrate love. The greatest love ever known is God’s abundant love for us, His children. And He often demonstrates that perfect love through imperfect people. These stories represent all kinds of love. Woven through each story is the sustaining hand of our loving heavenly Father. On Valentine’s Day—and every day—whether your life is chocolates and flowers or loneliness and pain, let these stories fill your heart with hope, peace, and most important, love. 21 Days of Love… Stories that Celebrate Treasured Relationships – Tweet this! 21 Days of Love is a beautiful book, from cover to cover. Now, I don’t usually begin my reviews by complimenting the cover, but it’s perfect. Matter of fact, each of the book covers for this series are thoughtful and true to the subject covered within its’ pages. Inside this book, you will find stories of love . . . stories that represent the many different types of love that we all experience, from the relationships we have with our parents and siblings, our spouse and our children, as well as friends, and even strangers. But these aren’t stories to bring false hope, or present fairy tales; instead, they are written to encourage us as we go through rough times. The very first story describes how an accident changes a young girl’s life — and her future. Left with feelings of hopelessness, she discovers that God has another path for her life, if she’ll only trust Him with her future. Each story in this devotional is encouraging, uplifting, and heart-warming. I was continually reminded of God’s love for me. And that He is always waiting for me, even when I’ve drifted away at times. His love for me is an everlasting love, full of promise. If you haven’t read 21 Days of Love, or one of the companion books in this series, I encourage you to read it. 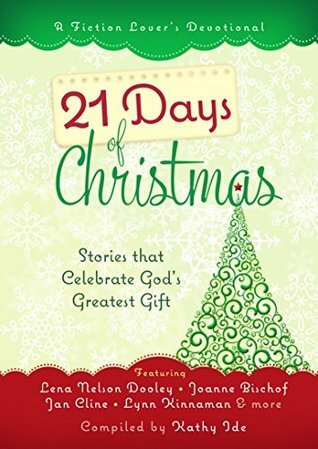 Today I am reviewing 21 Days of Christmas, a fiction lover’s devotional featuring 21 authors, by Kathy Ide. Christmas is more than just a holiday. It is a time to recapture the joy and wonder of God’s greatest gift: His Son, Jesus. 21 Days of Christmas will warm your heart with stories about giving, loving, and family. These engaging tales celebrate the hope and joy that make this blessed season unique. At the end of each story you’ll find an insightful message that will help you discover anew the true meaning of this special time of year. So grab a cup of hot apple cider with a cinnamon stick, curl up in your favorite chair beside a picture window overlooking a serene spot, and savor the true meaning of Christmas through these inspirational and encouraging stories. 21 DAYS OF CHRISTMAS… Stories that celebrate God’s Greatest Gift – Tweet this! 21 Days of Christmas will be a inspiration to all who read it! These wonderful holiday short stories will attract believers as well as non-believers… and will be a great witness to all. Kathy Ide has taken twenty-one stories of Christmas and brought them together to inspire and uplift the holiday season. Although a few aren’t stories I would normally enjoy, I feel that most readers will be blessed by them. Along with the first book in this series, 21 Days of Grace, it makes a great addition to any personal library. It can also be used as a devotional, with life applications included with each story. Each of these stories can be read in a short time, so you can enjoy them anytime. I plan to purchase several copies to give as Christmas gifts! Experience the joy and wonder of God’s greatest gift: His Son, Jesus. – Tweet this! 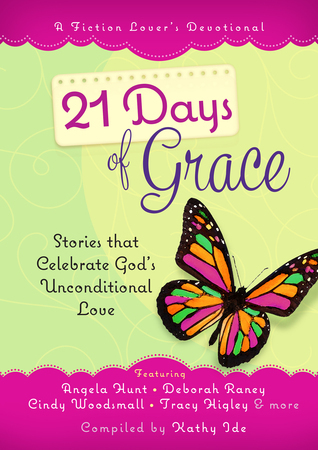 Today I am reviewing 21 Days of Grace, a fiction lover’s devotional featuring 21 authors, by Kathy Ide. Christians have long loved devotionals, but today’s Christians are also developing a strong love for fiction. They want to read stories about characters they can relate to, who experience situations similar to their own, and learn from those examples how to live out their faith. For them, life lessons are more easily absorbed this way. Start your day with 21 Days of Grace… by Kathy Ide – Tweet this! 21 Days of Grace is a blessing to those who read it! Kathy Ide has taken twenty-one wonderful stories of grace – and brought them together to inspire and uplift those who read them. I can only imagine how difficult it was for Kathy to choose which stories would be included – and I’m hoping another book will be released sometime in the future. While it makes a great addition to any personal library, this book can also be used as a devotional, with life applications included with each story. I plan to purchase several copies to give as gifts; the stories would attract believers as well as non-believers, in my opinion, and would be a great witness to all. The stories are full of goodness, yet can be read in a short amount of time. This would be a great book to begin your day… and since many of the writers are favorites of mine, this is just what I’m planning to do. I can’t think of a better way to start my own day! This book deserves a solid 5 stars in my opinion… I only wish I could give it a higher rating.